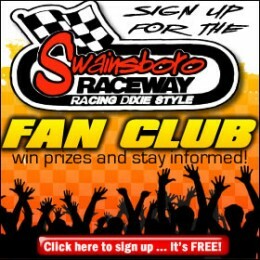 By admin Comments Off on Crank It Up 100 at Swainsboro Raceway! 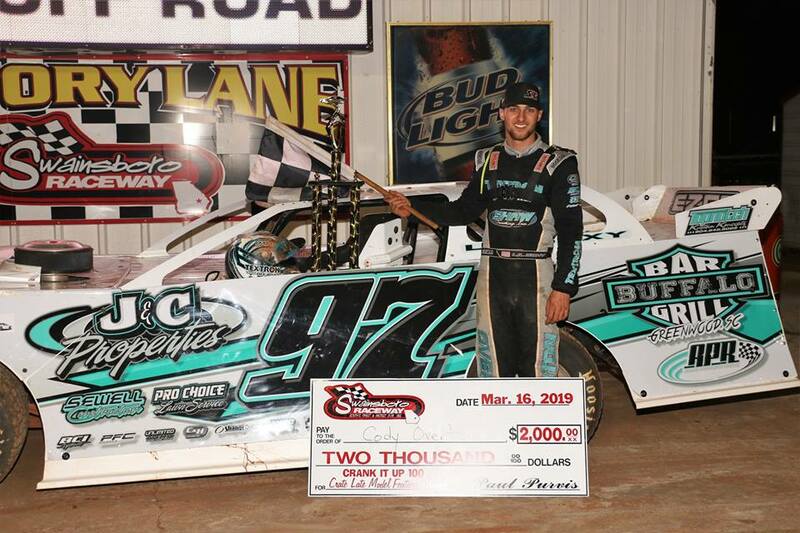 Swainsboro Raceway kicked off the 2019 racing season Dixie Style Saturday night with the Crank it up 100 as 70 cars and drivers registered in six different divisions for the first points race of the year. The evening began with the annual car show as drivers showed off their new scheme for the season. 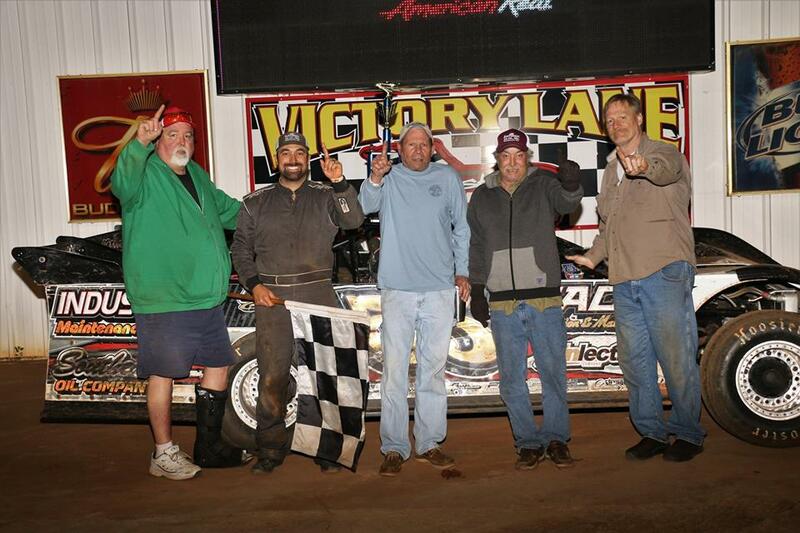 In the Scare House of South 440 division Scott Helton picked up first, Bill Keisel second, and Chris Atkinson third. 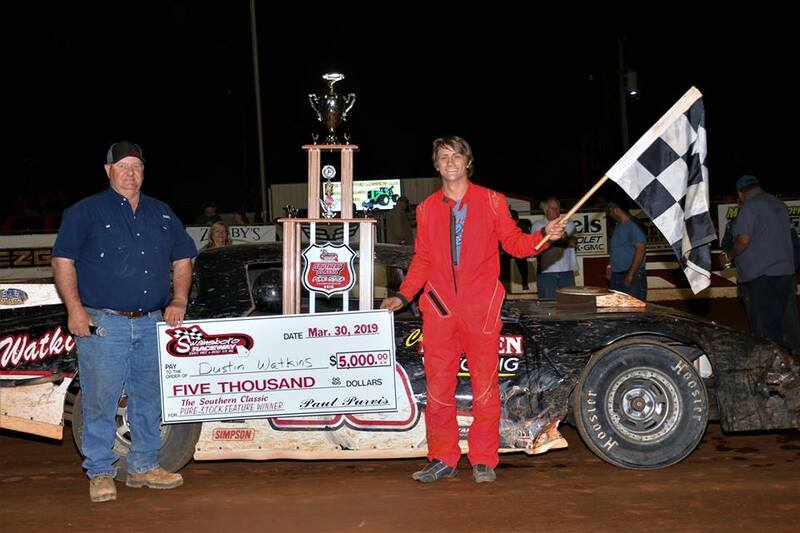 After earning the title of points champion in 2018, Tyler Davis moved up and took first place in the Roger Wheeler Construction Road Warrior division, Tyler Sanders second, and Graham Stevenson third. 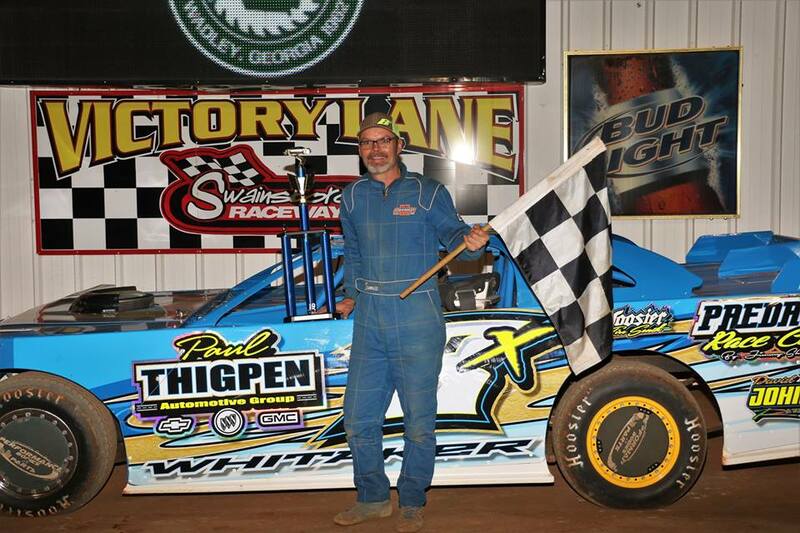 In the Daniels Chevrolet Pure Stock division, closest over all in votes, Kip Poole earned first over Tommy Davis. 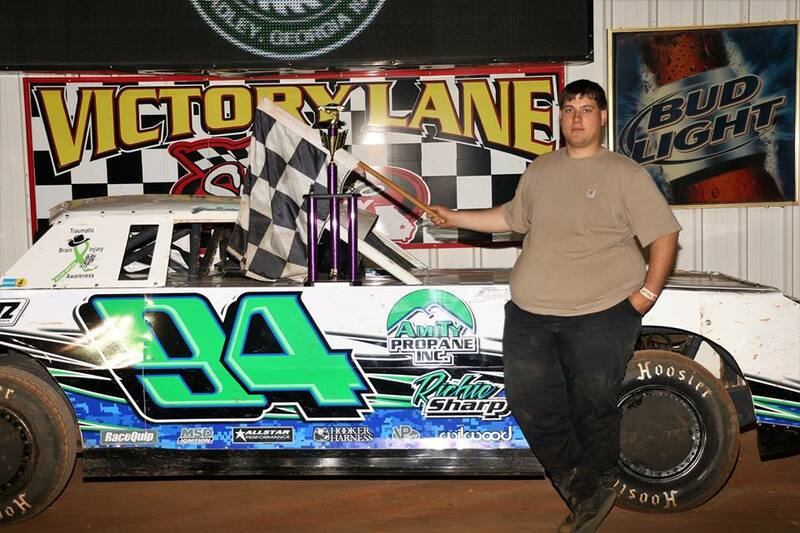 Brent Herndon earned first in Sunoco Super Street and Chesley Dixon Zaxby’s Crate Late Model division. After hot lap qualifying and two heat races, Pearson Lee Williams led the Zaxby’s Crate Late Model division to green for the first feature event of the 2019 season paying $2000 to win with Cody Overton sitting outside. Williams looked unstoppable on a rail out front, as Overton fell into a comfortable second, Blake Smith took third with Garret Shurling fourth. By halfway, Williams started lapping cars. Just past the halfway point, lap sixteen, Williams broke leading going into turn two as his front bucked, bringing out caution. Unfortunately for Williams his first Victory of 2019 fell short and Overton took the lead with fourteen laps remaining. On the restart, Chesley Dixon makes a move to take over the fifth position from Brandon Carpenter. Ten to go, Jordan Feider gains momentum and takes over sixth. Cody Overton takes the checkered, Blake Smith rides in second, Garret Shurling third, Joshua Bishop fourth, and Chesley Dixon fifth. 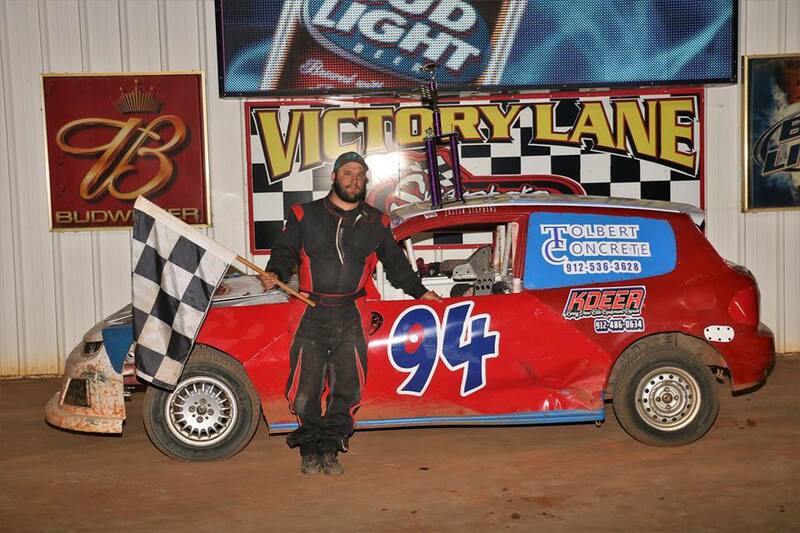 Picking up the first heat race win of the 2019 season, Monk Gulledge led the Southland Insurance 602 Sportsman division to green. Blake Akridge on the inside makes a fast charge for second but Ricky McClain quickly regains. Lap two, Cameron Tribble takes third from Akridge and moving from the rear Ben Faircloth is in fifth. A caution on lap four sends the field back to dixie double file restart and Faircloth takes advantage moving into the fourth position. Faircloth proving to be a top contender picks another one off just at the halfway moving into the third position. However, Monk Gulledge never slips leading flag to flag taking the checkered with Ricky McClain second, Faircloth settling at third, Cameron Tribble fourth, and Eric Register rounding out the top five. In the Sunoco Super Street division, Jamie Whitaker and Daniel Roland lead the field to green. Roland fighting handling issues brings out two cautions back to back sending the field to single file restart. Once single file restart, all eyes on Whitaker as the 8x machine checks out for payday. Jamie Whitaker rides to Victory lane with Brent Herndon picking up second. Bringing fans to the edge of the seat, Dustin Watkins and Kip Poole battled door to door in the Daniels Chevrolet Pure Stock division. Kip Poole took the lead off turn two on the outside. Brent Herndon then dove to the inside of Watkins for the second position for several laps trying to get by Watkins. Jamie Donaldson peaked to the inside of Rak Donaldson for fifth. 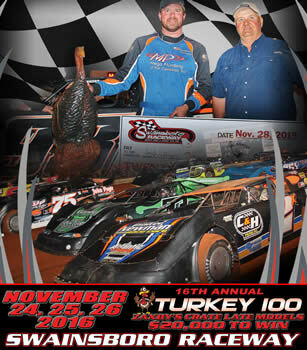 Kip Poole earned the win, Dustin Watkins held second, Brent Herndon third, Jamey Donaldson fourth, and Clay Alexander fifth. Rolling out in the Roger Wheeler Construction Road Warrior division, Tyler Sanders checked out to leave the battle in the his rearview. Jordan Johnson set his mind on second but Ridge McCoy looked to the inside as Graham Stevenson dove deep to the bottom making it three wide for second. Johnson battled hard to maintain position. Lap 6, George Williamson moved into the fifth position. 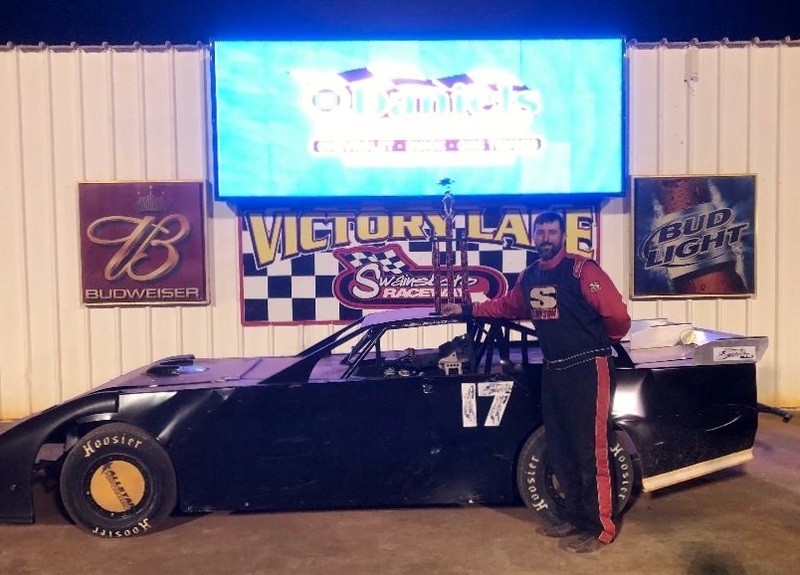 Tyler Sanders took his first win for the year, Jordan Johnson second, Ridge McCoy third, Graham Stevenson fourth, and George Williamson fifth. Twenty-one Scare House of the South 440 drivers registered with local boy John Hooks leading the group to green. After two attempts, the field went single file with Hooks out front and Walker Windham second. Lap 3, third place John Windham took the hard turn to pits ending his night early. Rod Morris moved into the third position. The front two bumper to bumper, with a green white checkered finished, John Hooks held of Walker Windham for the win. Coming to the checkered Rod Morris slipped in three, Scott Helton made the pass for third and Chris Atkinson finished out the top five. Swainsboro Kart Track Results Red Plate 1. Camden Harp, 2. Joe Brett Sullivan, 3. Trey Oliver. Blue Plate 1. Brayden Upshaw, 2. Seth McCallister, 3. Katie Pender. Pro Blue 1. Seth McCallister, 2. Chase Litchfield, 3. Brayden Upshaw. Green Plate Light 1. Ethan Martin, 2. Blaze Marcus, 3. Tanner Reich. Green Plate Heavy 1. Ethan Martin, 2. Blaze Marcus, 3. Tanner Reich. Clone EL 350 1. Nathan Lewis, 2. Chase Walker, 3. Tyler Dorris. Clone T3 330 1. Nathan Lewis 2. Jimmy Hawk, 3. Ryan Adams. Clone T3 350 1. Andrew Dove, 2. Nathan Lewis, 3. Justin Diekemper. Clone T3 375 1. Justin Diekemper, 2. Andrew Dove, 3. Joseph Diekemper. Pro Clone T3 375 1. Justin Diekemper 2. Andrew Dove, 3. Kamren Boyd. Clone Super Heavy 425 1. Joseph Diekemper, 2. Robert Diekemper, 3. Josh Lester. Predator 350 1. Dusty Godbee, 2. Todd Godbee, 3. Justin Blackwell. Predator 375 1. Dusty Godbee, 2. JJay Reich, 3. Hank White. Predator 410 1. JJ Reich, 2. Matt Black, 3. Dusty Godbee.